Who does not want to live in a luxurious residence? There is no greater joy than elevating your lifestyle to an entirely new level with your house as the backdrop. Kolkata has recently emerged as the capital for real estate in India. This has led to many real estate developers in Kolkata launching new projects here. This is because the property rates in Kolkata were much lesser earlier and people could easily buy flats in any given area. However, since the past decade, there have been many recent developments that have changed the face of the city. Hence, we need to be aware of the same and keep ourselves abreast of all the important news in this domain. Even though there are many locations all over Kolkata where you can buy a flat, North Kolkata still remains one of the prime destinations where you can book a new home. There are some prominent locations of the city like Dumdum, Shyambazar and BT Road where the recent upcoming projects are being launched. Hence, we will now have a look at what makes these places so popular and desirable among the people from all walks of life. This article helps you with details on how having a flat on BT Road can elevate your way of life to an entirely new plane. While many people have waxed eloquent on the various amenities that are being provided while buying a new flat, still not much attention has been given to the major factor of location playing an important role in the decision-making process of people who want to move into a new house. 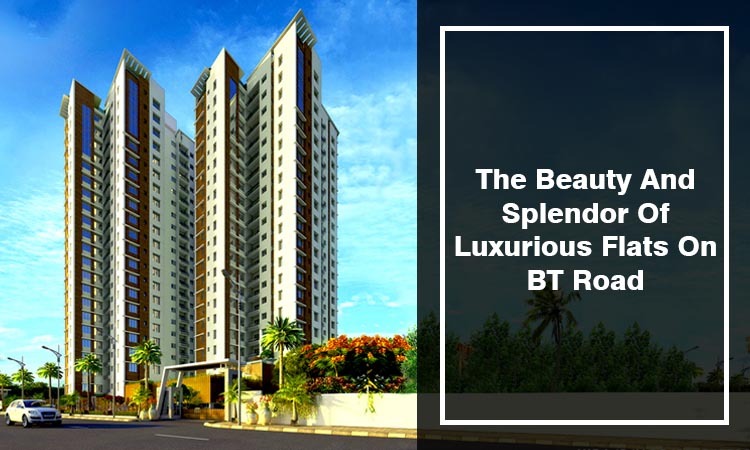 Read on to find out how buying a flat on BT Road can help you in the long term and why you should not delay this important decision in your life. This is because opportunity only knocks once and you should never let a golden opportunity go away. Kolkata is located on the Eastern bank of the River Hooghly. This makes the river a very important part in the lives of all Kolkatans. Another important fact to be noted is that the Hooghly is a distributary of the River Ganga. All Hindus consider Ganga to be sacred and they refer to Ganga as Mother Ganga. Hence, it is indeed a privilege to have a 2 BHK flat in BT Road on the shores of this river. This prized place is one of the few locations in Kolkata where you can live just beside the river and enjoy the uplifting ambiance of this calm, serene and tranquil environment. This not only brings you close to nature but also helps you have an amazing and uplifting spiritual experience. The Ganga view that is offered by the flats on BT Road is truly unparalleled. This is because of the strategic location where the river forms a beautiful bank in this part of the city. The best part is that your large and spacious apartments have big balconies overlooking this mighty and majestic river. This is how having an abode at BT Road can work wonders when it comes to having a breathtaking view that will surely leave you spellbound. BT Road is located at a very strategic section of the city making it easily accessible from all parts of Kolkata. Besides that, there are many facilities of public transport that help you to pick and choose from a wide variety of options available. This place is also good if you have a private car as there are well-connected roads to all parts of the city. Also, if you prefer travelling by rail, then there are quite a few railway stations located nearby coupled with a new metro station coming up in this part of the city. The airport is also located nearby should you decide to go on a long vacation either within the country or even abroad. Given the above scenario, it is clear that when you reside on BT Road, you will definitely have an enhanced ease of commute to all parts of Kolkata saving you a lot of time and energy. In modern metro cities, there is hardly any green space available due to the indiscriminate construction going on in all parts of the cities. However, Kolkatans are lucky in this regard as it is the only metro city that has both parks and ponds that help in safeguarding the environment. This clearly reflects the high level of greenery that Kolkatans enjoy. Among all the parts of this beautiful city, BT Road in North Kolkata is one of the best. This is because you get the veritable combination of both greenery and water at the same time. The lush green coconut palms and banana trees are the perfect backdrop for every writer and poet. You may not aspire to be the same but can clearly enjoy the benefits at no additional cost. Since there is the option of having nature’s bounty in the middle of the city, why should you miss out on this wonderful chance? Everybody nowadays loves to have a car. A car can have a lot of benefits when it comes to ease of traveling. However, most people all over the world face the problem of having no place for parking. This is especially true in smaller residential buildings where there is very little space for fitting the cars of all the residents. Hence, renowned builders and developers have come up with the innovative idea of providing parking facilities for all their residents right in their residential complexes. This saves the time, energy and cost of all the people involved. This is especially true in upcoming locations like BT Road where it is estimated that most of the residents would definitely aspire to have a car for their convenience. Considering these facts, it is highly commendable that these realtors have given a thought to the residents of the city without thinking only about their profits. Hence, we must definitely rise to the occasion and grab the opportunity that is coming our way. BT Road is surely the go-to destination of this decade and we must check out the facilities that it has to offer. From the above, it is clear that the beauty and splendor of flats on BT Road cannot be compared to those in any other part of Kolkata. So you must definitely check out the new residential projects in Kolkata before it’s too late!